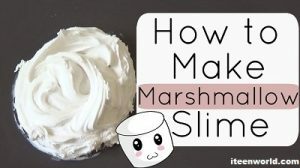 Here is a super easy recipe to make edible slime, I’m going to be testing out some popular edible slime recipes, and I really hope that you enjoy this guide. You think, what ingredients do you need to make edible slime? Make edible slime with Starburst, Marshmallow, Cornstarch and Haribo gummy bears. You can also add some food coloring if you like, but it is not necessary. You probably already have these at your house! 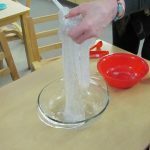 To Learn more about How to make slime with laundry detergent click here. We’re going to need some starbursts and I decided to use all of the red ones just so it had a matching color, and I popped it into the microwave for 15 seconds before getting some icing sugar. You want to add this really gradually because you do not want this to have a doughy texture, you really want this to be a slime. I did add this when it was hot, but before going in and touching it with your hands, you need to leave it for at least an hour to cool down, because sugar can stick to your hands and really burn you, so I do recommend getting a parent to help you out with this. When it has cooled down like this, it may be a bit hard, so you may want to add some oil or some water just to loosen the mixture up, but you just want to keep adding some icing sugar until it isn’t sticky anymore, and it makes a really nice, stretchy slime. 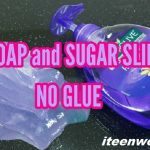 Tips to learn more about how to make slime with glue and water only. First of all, at a medium heat, add your 1 bag mini marshmallows and coconut oil to a mixing bowl and mix continuously until melted. After melted add cornstarch and icing sugar. Mix with your hands. Note: this will get more STICKY! To help with this, you can coat them in coconut oil. 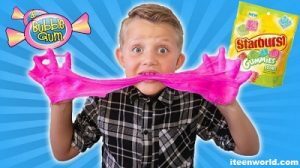 It should be stretchable and not sticky. You can keep adding cornstarch, icing sugar and coconut oil until you feel happy with your texture. Now you can add food coloring. Now play with your slime and take a bite, too! This recipe isn’t the best tasting one, but it’s so cool to play with, and it definitely is edible. And you want to stir it all in, and the first batch of cornstarch is normally quite easy to stir in because it just dissolves, but the more cornstarch you add, the thicker the mixture will become. It will become a lot harder. So what I recommend doing is just pushing the cornstarch under, and then at a later stage is going in with your hands and breaking up all of the lumps, but you just want to keep getting the cornstarch under and trying to stir it in. After adding in the second batch, I do recommend just taking it a bit slower, because otherwise, the mixture can get really thick like this, ’cause I added a bit too much cornstarch, and I needed to go in and start over and add some more water. I needed to go in and break it up with my hand which became quite messy, but again this just helps the texture get a bit better, and you just want to keep adding cornstarch again until it becomes thick. And as you can see there, it became a bit too thin, so I added a tiny bit more, and as you can see it’s made all of the difference, the tiniest bit makes it super thick, so do not rush this method, and you’re going to be left with a really cool slime, and I don’t recommend eating lots of this, normally it’s used to thicken up gravy, but you can have like a teaspoon worth, I just wouldn’t recommend a whole bowl. We have a slime that really surprised me, and was so stretchy, even when it cooled down, and this is made out of Haribo gummy bears, and I just added the whole pack of this, and this really didn’t take a long time to melt, I think it was about 10-15 seconds in the microwave on top heat. The mixture was so sticky so I went ahead and added a whole tablespoon of icing sugar to start off with, and the mixture kind of looked like caramel, it was so sticky, and it was just such a nice texture, and it wasn’t an ugly color either which I was really surprised with because all of the colors were mixed together. So I just kept adding my icing sugar really gradually, and eventually, it was losing its stick, a bit. I was really worried that when I started playing with it, it would become like a dough, so I started adding it gradually with my hands and playing with it, and it became such a nice texture, and was so, so stretchy. I really hope that you enjoyed and if you did don’t forget to give it a thumbs-up. Also share with your friends too.